Latin American Countries Urge Investigation Of Venezuela For Crimes Against Humanity The countries have submitted a request to the International Criminal Court in the Hague for an investigation of alleged human rights abuses in Venezuela dating back to 2014. 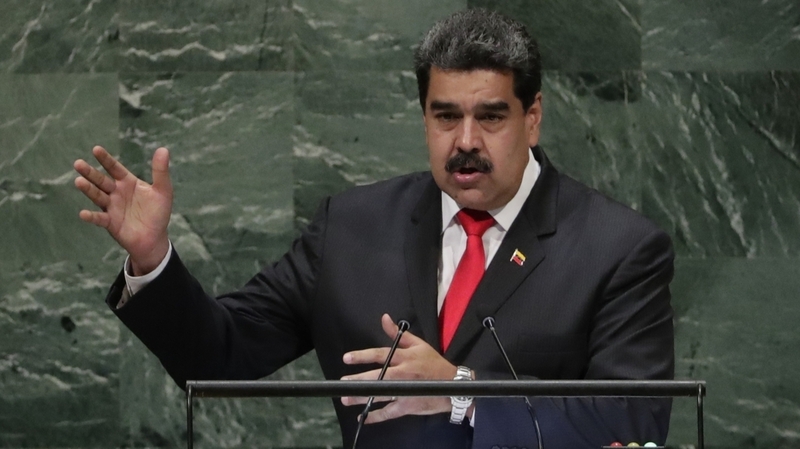 Venezuela's President Nicolas Maduro addresses the United Nations General Assembly. Several countries have requested an investigation of Venezuela for alleged crimes against humanity. The alleged crimes in Venezuela date back to 2014, and include torture, the arbitrary detention of political opponents and anti-government protesters, and more than 8,000 extrajudicial executions cited in a dossier by the Organization of American States. Jose Miguel Vivanco, head of the Americas division at Human Rights Watch, spoke to NPR, "Our research shows that the abuses in Venezuela were not isolated, or the results of excesses by rogue security forces members. Our documentation actually shows that multiple security forces committed widespread abuses repeatedly, over a period of months and years, in different locations across the country, including in controlled environments such as military installations, or police stations." Pressure is building on the government of Venezuela, where economic and humanitarian crises have forced millions of people to flee the country. The UN Office for the Coordination of Humanitarian Affairs calls it "one of the largest population movements in Latin American history," and the mass migration is taxing resources in neighboring countries. Venezuelan President Nicolas Maduro's government has called the country's refugee crisis a "fabrication" by the U.S. and its allies. Despite an apparent assassination attempt at a military parade earlier this year, Maduro has held onto power. Vivanco says Venezuela is "unique" among countries in South America because of its "total concentration of power in the hands of the executive branch." "There is no independent judiciary in Venezuela. There is no independent prosecutor. There is no single, independent, democratic institution capable of challenging the abuse of power in Venezuela, challenge or prevent human rights violations, endorsed, promoted, instigated by the security forces," Vivanco continues. This week the U.S. sanctioned four top Venezuelan officials, including the first lady. Steven Mnuchin, the U.S. Treasury Secretary, said the U.S. "will continue to impose a financial toll on those responsible for Venezuela's tragic decline, and the networks and front-men they use to mask their illicit wealth." The Financial Times reports an investigation by the ICC "could also pave the way for the UN to invoke its 'responsibility to protect' — a 2005 pledge endorsed by all UN members to prevent genocide, war crimes, ethnic cleansing and crimes against humanity." A year ago President Trump said the U.S. was considering a "military option" for Venezuela, and last month Florida Republican Sen. Marco Rubio said there's now "a very strong argument" that Venezuela presents a security threat to South America that calls for the use of the U.S. military.